DONT BUY OPTUS NBN! SO SLOW ! I've upgraded to NBN from ADSL in december 2016. 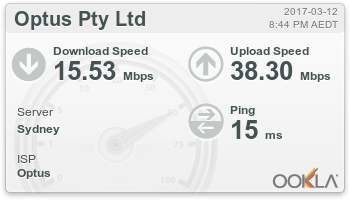 ADSL download Speed was around 15mpbs download. Then I upgraded to NBN 25mbps pland and download speed was even lower at 5-10mpbs! So a few days later I upgraded again and changed modem (made sure it was on the most optimized WiFi channel (with Optus tech support) and in the center of Sydney City zipcode 2000 (World Square) i was only getting 65mpbs out of the 100mbps promise on contract. Barely half for $145/month! Great rip off they have for only 2/3 of performance! Spent countless hours on the phone with them, new modem and everything.... it's still crap! Such a rip off this company! The maximium speed is 65MB on a 100/MB line in the middle of sydney...when it's really early in the morning. in 2017, Rarely hits that number...now its 10-15 MB download speed...on 100Mbps connection at 8-9pm on sunday night. Yea on the phone they will tell me all their excuses, network is busy and all, but can't even stream Netflix or YouTube properly without buffering every 5 seconds on 100mbps connection. I think im going back to ADSL on Telstra or a reliable company. Optus is terrible ! 5) They say copper lines to the building might limit speed. I live in a 60 stories building in the middle of sydney which was built 15 years ago, copper lines can't be that old!! I wonder what it would be for people living outisde the city with old copper lines that are 30-40 years old! Must be a nightmare if we can't get half the speed here with new copper lines inside the city! and the excuses keep pilling up. Re: DONT BUY OPTUS NBN! SO SLOW ! Hi @naik_michel, really sorry for the experience you've had with your NBN speeds, definitely get that this would be frustrating. I can see we've already replied to your other post regarding the NBN speeds. Please keep your posts to one thread so hat we can be fully across. Speed is getting worst on a 100mbps/40mpbs ! Area is so congested, about time to wake up Optus! 7mpbs download on a 100mbps line for $140 a month is not acceptable! Far out you guy have lawsuits coming your way, every 2 message on your forums is about how slow your speeds are compared to advertised speeds! Mine is not even 10 % speed of the 100mbps advertised for NBN by Optus! Definitely get this would be frustrating @naik_michel. The speeds are certainly not looking good. As mentioned by Jax to your PM we don't have an ETR on upgrades yet. Did you call the call centre number we advised you to call to? You need to make a complaint to the TIO, they know they have a issue but stalling to get it fixed. If you guys are having slow speed with optus contact TIO Obudsman on the link above. Optus will get a $10,000 fine per case if they can't fix the problem, which they obviously can't in my case. It's getting worst ! Tonight 4mpbs at 9pm in middle of Sydney city 2000) on a 100mpbs/40mbps connection plan! It's getting slower guys ! 2mbps on 100mbps download connection ! WOW! Can OPTUS get any slower ?! What a crooked company and fake advertising 100mbps and getting 2 mbps!!!! it's terrible !!! Optus is owned by SINGTEL, a multi-billion dollar company from Singapore, if they don't fix this fast....they're gonna crash and burn as 2/3 messages on their forums are about slow speeds ! Hi naik_michel, I'm sorry you're having trouble with the internet speeds. Sounds like you've been in touch with Tech Support already. Their line of questioning is necessary to isolate issues. Ethernet is used to test line speeds directly, without possible Wi-Fi interference. Where we don't advertise a guaranteed speed (services are rated by a max allowed speed), you should certainly be getting much higher than we're seeing there. Unfortunately, there could be several factors affecting your service, and this can only be done by Tech Support testing live.